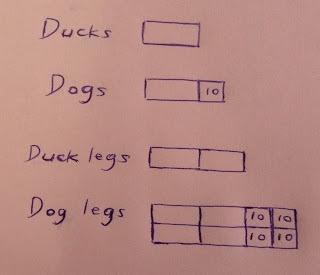 Recently, while reviewing some grade 5 olympiad questions for a local company, which specializes in conducting olympiad math programs in elementary schools, I came across the following nonroutine dogs-and-ducks question. The number of ducks is 10 fewer than the number of dogs. The dogs have three times as many legs as the ducks. How many ducks and how many dogs are there? 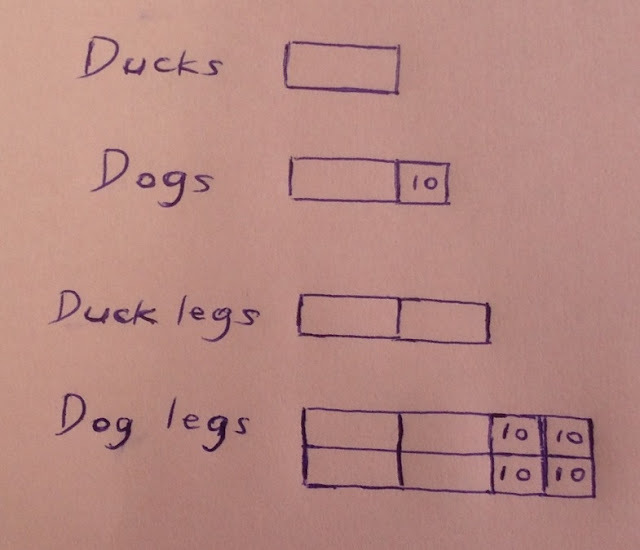 Since there are 10 fewer ducks, and each duck has 4 legs, there are 10 × 4 = 40 fewer duck legs. A quick check shows that the answers don't satisfy the given conditions in the question. Although the dogs have three times as many legs as the ducks, however, the number of ducks is only 5 fewer than the number of dogs, which is expected to be 10. The lesson here is to identify the illogical step, although seasoned problem solvers would probably not commit this kind of error or blunder. In general, it's one thing not to make an error, and get the correct answer; it's another thing to be able to explain someone else's error. At a deeper level, it's sometimes conceptually harder to explain someone's flawed reasoning to an incorrect answer than just know how to solve a problem. Think of mathematical fallacies and paradoxes, where in a number of cases the illegal step is anything but obvious. In this case, students would easily realize that the answers are also incorrect, when they find out that the number of dogs isn't an integer. Why don't you try solving the dogs-and-ducks question on your own first, before comparing your solution with the ones I've worked out? If yours is an alternative (or elegant) solution, the mathematical brethren couldn't wait to reading it! Since a dog has twice as many legs as a duck, and there are 3 times as many dog legs as duck legs, there are 3/2 times as many dogs as ducks. Therefore, there are 20 ducks and 30 dogs. Let ④ represent the number of duck legs. The number of ducks is 20, and the number of dogs is 30. If you like being challenged by similar dogs-and-ducks or chickens-and-rabbits problems, may I direct you to solving two more questions at Yan's One Minute Math Blog?